For 100 years, the remains of a once-thriving Native Hawaiian village in Honokowai Valley lay dormant. Today, dedicated volunteers are restoring it—from the sticks to the stones. I know there are times when Honokowai Valley is dark and rainy. But every time I’ve seen it, it’s full of light, and that’s the way it stays in my mind. Birdsong echoes down the steep mountainsides that plunge 300 feet from sky to valley floor. Sunlight reflects off the diamond-shaped leaves of huge kukui trees arching over a streambed of rounded rocks. Layer upon layer of ancient stone terraces wind up the slope. Within each terrace, broad green faces of newly planted taro nod in the breeze, sheltered by the spirits of long ago. 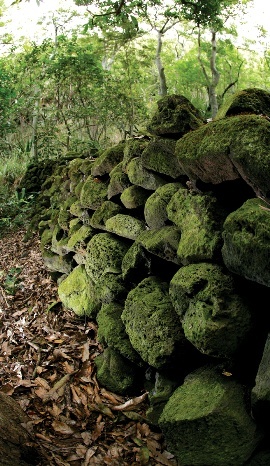 The mossy rock walls of Honokowai Valley are largely intact. Like time machines, they provide a glimpse into the civilization that once thrived here. On my first visit, my husband and I bump through the cane fields and the coffee farms in the back of Ed and Puanani Lindsey’s truck, past tangled forests of Java plum and haole koa, down steep inclines and across rocky streambeds, until we come to a place where the dense foliage parts like curtains on a stage. Puanani gets out of the truck to open a low gate with stands of ti plants on each side. As Lindsey drives slowly through into the valley, I am moving, slow motion, back in time. I can almost see the sweating figures of men working in the lo’i kalo (taro patches), hear the laughing children running out of the thatched hale (house), and feel the rhythm of women pounding tapa in the sun. One hundred years ago, this was a working village—in fact, the “breadbasket” for the Ka’anapali region. 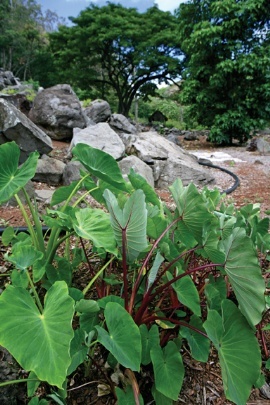 Here, ancient Hawaiians grew taro, sweet potato and squash in the rock terraces they built. They crafted fishhooks, lines and lures; poi pounders, kukui lamps and anchors. The valley gave them everything they had, everything they needed. Vrrrrrr! The metallic whine of a chainsaw shakes me from my thoughts of ancient Hawai’i. These are modern times, and modern tools are being put to use here by modern people—people like me and my husband, seeking a way to express our appreciation for this island and this culture. Dryland taro, a Hawaiian food staple. Project Malama Honokowai gives us and other volunteers an opportunity to put our gratitude to work in a very real way. The project’s goal is to care for and preserve a valley that archaeologists describe as the region’s most prolific, intact example of a working village. In 1999, Ka’anapali 2020, a community-based planning project, contracted Xamenek Researches to conduct extensive surveys of Honokowai Valley. Those surveys revealed that beneath the dense foliage were numerous archaeological sites, including homes, farms, trails and heiau (places of worship)—evidence that the valley once contained a thriving, self-sufficient village of about 600 families. But by the 1920s, a paradigm shift was occurring. The stream water the families used to irrigate their lo’i was diverted for sugarcane cultivation. Their sustainability gone, the people left the valley to forge a new way of life—”from agriculture to the unknown,” Lindsey says. A Native Hawaiian, Lindsey is president of Maui Cultural Lands, Inc. (MCL), a nonprofit land trust formed in 2002 to facilitate the restoration of cultural sites. As the most historically significant in the region, with the most prolific archaeological remains, Honokowai was number one on the list. Every Saturday morning for the last seven years, he and Puanani have been driving from their home Upcountry to the valley. Working with an ever-changing group of volunteers, they are clearing away the alien overgrowth from a steadily widening section of land, revealing rock walls, house sites and artifacts—the slow, piece-by-piece revelation of a buried treasure. “When we started, that was the only rock we could see,” Puanani says, pointing to a prominent boulder embedded in the stream bank. 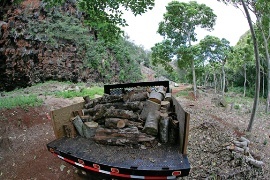 So much clearing has been done,the designated dump-run truck is affectionately named Hana Hou (to repeat). 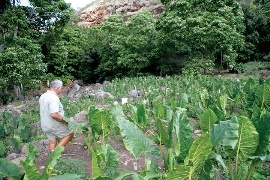 Ed Lindsey takes a moment in his kalo fields to survey the work. Now, through the ongoing efforts of volunteers, you can clearly see the layout of the village—and feel the presence of its former inhabitants more strongly. Honokowai Valley might be the only place where you can accomplish that with a chainsaw. Volunteer Mitch Brinks, an ophthalmologist, has cut down hundreds of trees in Honokowai Valley over the last five years—invasives that compete with native species. “The only way I could’ve done that [safely] is with the spirits watching over me,” he says. One of the many endangered native plants here is awikiwiki. Ancient Hawaiians woven this hearty vine into a loose basket for catching baitfish in tide pools. For Andy Taira, a retired landscaper, the valley provides an unending opportunity to learn about Hawaiian culture. Boots pulled up over his jeans, Taira is a quiet mainstay on the slopes and terraces—chopping weeds, spraying herbicides, planting koa, tending the dryland taro. “I like to discover something new every day,” he says. As I pull on my workgloves and safety goggles and begin dragging branches of Java plum to the wood chipper, I can feel it, too. Even the roar of the chipper can’t steal that heavy peace. It lives in the strength of the pohaku (stones) that line the terraces, the stillness that pervades the golden afternoon, the sudden rush of wind through the kukui leaves that makes me look up, with chicken skin, from my work. Later, the volunteers gather for a well-earned lunch under the spreading branches of a huge monkeypod tree. Lindsey lifts a teardrop-shaped stone, balancing its weight in his palm. “We are discovering little by little about our ancestors,” he says. The shape of this particular stone tells of pounding poi, staple food of the ancient Hawaiians. Other stones reveal other uses, and tell other stories. But for the last hundred years, native plants in Honokowai, and the Hawaiian Islands overall, have been under attack from invasive species and foreign diseases. Lindsey strolls through a field of ‘ape, a Tongan relative of Hawaiian kalo, part of a farming collaborative with Opunui-Hala ‘Ohana from Lahaina. Puanani bends over a small ‘ohi’a tree whose leaves are darkened with a rusty fungus. She strokes the diseased plant with gentle fingers. “We may lose this one,” she says, her voice pained. With the same concern, she examines the bright orange seeds from a gnarled wiliwili tree. The gall wasp has decimated the valley’s wiliwili, from whose lightweight wood ancient Hawaiians made canoes, surfboards and fishnet floats. Now the leaves are curled and lumpy with disease, and many of the taller trees have died. Volunteers are battling the invaders by hand, chainsaw and herbicide—whatever it takes to keep intruders at bay. 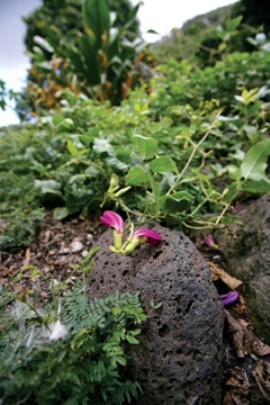 Once the ecosystem is stabilized, native Hawaiian plants have a fighting chance to reclaim their soil. 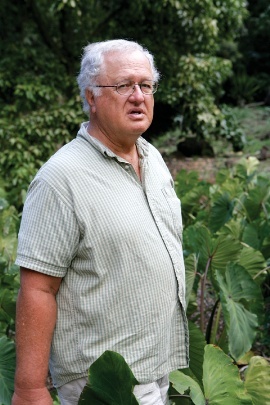 Revered native-plant expert Rene Sylva got the work started in 2000 by planting and cultivating dozens of endemic and endangered species on the slopes of Honokowai Valley. Today, plant lovers continue Sylva’s efforts, nourishing the plants with water siphoned (with permission) from KDC’s irrigation system. Even with the clearing and replanting already accomplished, future generations will have their hands full. Honokowai Valley extends for three miles up the mountain and two miles down to the sea—”giving one person enough work for five lifetimes,” Lindsey says. Fortunately, the project is more about the journey than the destination. There is no plan to create a Maui version of O’ahu’s Polynesian Cultural Center, Lindsey says. Instead, he hopes the valley will simply serve as inspiration for people to look at what’s in their own backyard and their own heart. Here, within the weighty peace of the valley, an ancient way of life is being uncovered. Layer by layer, lifetime by lifetime, the treasure is coming to light. Copyright © 2006 The Maui No Ka Oi Magazine.